I am very happy to share some traditional Malabar dishes in my blog Ayesha's kitchen - the taste of malabar. This leftover rice puttu recipe is a great addition to my malabar snacks album. Am with yet another traditional evening sweet snack - Pooram varuthath. Usually this snack is made with rice powder or with pachari varuthu podichath. But here am sharing how to make pooram varuthath with left over puttu (leftover rice flour steamed cake). This snack is very popular and common among keralites especially among malayalees. I still remember these snacks which were regular at homes for our tea time snacks. But these days with the introduction of bakery snacks, people dislikes making such snacks instead they depend more on store bought fried snacks. 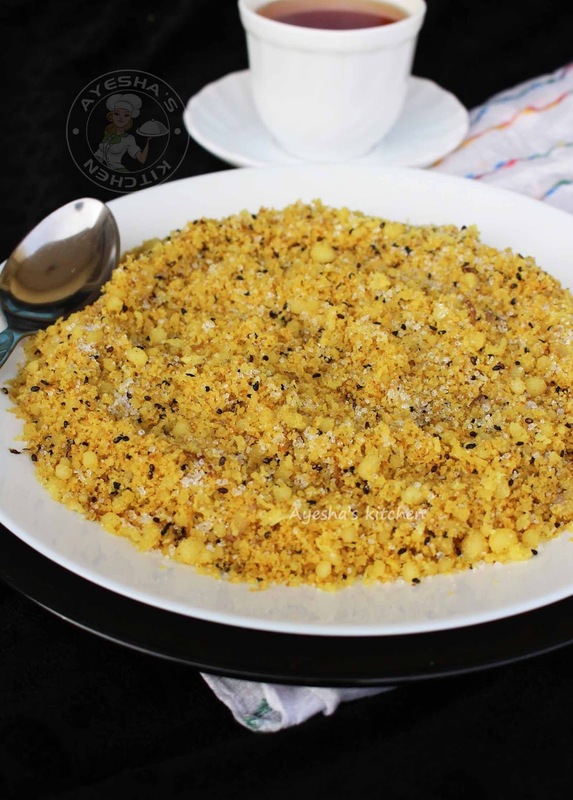 Those days (my childhood days) pooram varuthath was prepared in bulk and stored in an airtight container for months (i mean pooram podi with rice flour). Pooram podi with leftover puttu has 2 days of shell life, when stored in an air tight container. My grand mother and her helper make this snack (with rice flour) often at her home (my moms home). Though she never enters kitchen for cooking, she love to make special sweets for her grand kids with the help of a helper. Once done, she will pack this roasted rice powder snack in several containers and will visit us with this sweet lovely snack the next day itself. But now a days, people start buying store bought pooram varuthath, but never gets the real fragrance and taste of that made at home. So don't ever throw left over rice puttu instead make some sweet lovely snack to savor along with black tea. 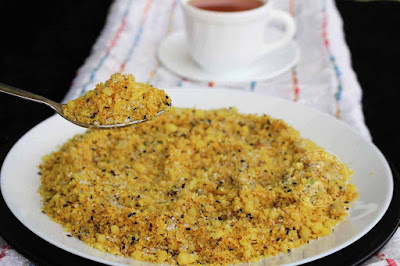 I used to add few teaspoons of this sugary pooram varuthath / poora podi in my hot black tea and have this using a spoon ...Whoa ...just cant wait for that tasty treat. Add the crumbled leftover puttu or steamed cake in a blender and pulse for a second or two, to powder it. Heat a big non stick pan or wok with ghee. Once it melts, add black cumin seed (karinjeerakam) or black sesame seed (karutha yellu). Saute for a while to crackle. Once crackled, add shallots chopped and saute for 30 seconds. Then add, grated coconut, turmeric powder, a pinch of salt and saute for a minute. Then add the powdered puttu. Mix well to combine. 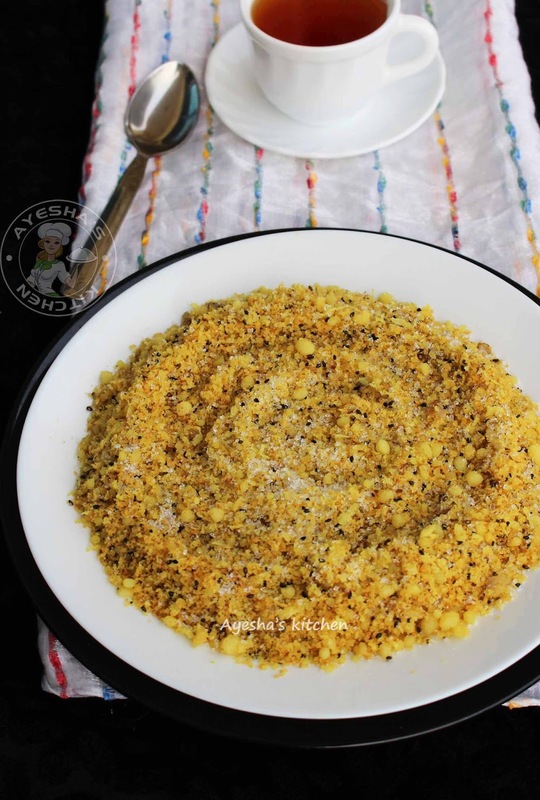 After 5 minutes, add fennel seed powder and mix very well. Now dry roast the mixture stirring continuously (very important) on a medium low flame for about 15 - 20 minutes or until the mixture turns dry and crisp. Roast over a medium low flame. Remove from flame and let it cool completely. While serving add sugar and mix well. Serve along with a black tea. Tasty.